Who was that face/body painter you met at that one party? Chances are it was Jessica, owner of Creative Chippy Party Services! You can find her at Mojo Grill & Catering on the Silver Springs Blvd every Wednesday night! If you are looking to add a little something special to your next party, whether it’s a kid’s party or not-for-kids party, give Jessica a call at Creative Chippy Party Services! We have met her at many different parties these past few years, and we are always delighted to see the smile on our daughter’s face when she gets her face painted! Jessica is just a down-to-earth and an enjoyable person. She can handle the small children, as well as the adults! She is very artistic and we are always amazed watching her work he magic. 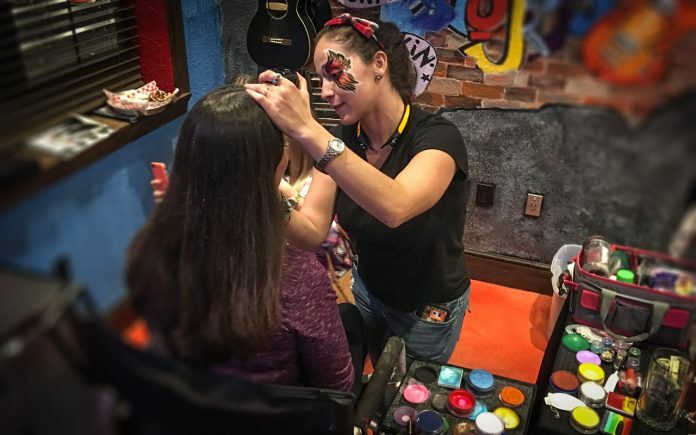 Get your face painted by Jessica each Wednesday night during Kid’s Night at Mojo Grill & Catering (5 p.m to 9 p.m.) on the boulevard! Creative Chippy Party Services specializes in making your next party original, artistic, and uniquely creative! VISIT CREATIVE CHIPPY PARTY SERVICES TODAY!